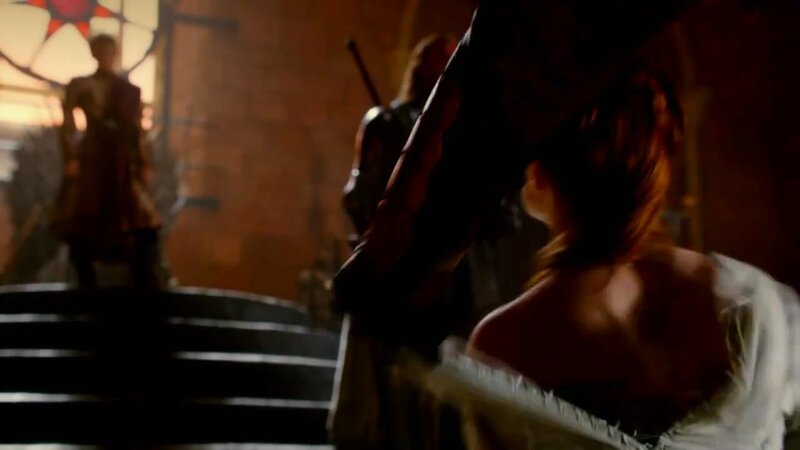 And here Joffrey is having Sansa humiliated and abused (by Ser Meryn of the Kingsguard) in the middle of the throne room, as the Hound watches. That’s going to be heartwrenching. Have to note a little detail, though: Sophie Turner has referred to wearing a corset the first season, and it looks like you can get a glimpse of it here. There’s so much attention to detail, the corset she had last season had a dragonfly embroidered on it even though the corset was never going to be shown that first season.